Friday, 18th April, 1969, the foundation stone was laid for a new church by Most Rev. Dr.S. Lourduswamy, then Bishop of Bangalore. May 1971, Rev.Fr. L. Peter was appointed as the first parish in-charge and Parish Priest of the new church. The land was bought for the church, popularly known as the "Rose Garden" There were no primary facilities like no proper road and no street lights and everything was jungle. September 1972, this new Parish was canonically erected by the Most Rev. Dr. P. Arokiaswamy, Archbishop of Bangalore. 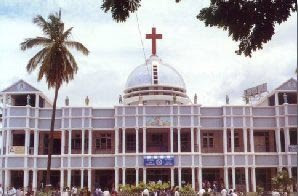 March 1974, Issue with the local authorities, the plan for the new Church need the approval of the Bangalore Development Authority. Friday, 29th June 1979, on the day of ﻿Solemnity of Peter and Paul, apostles, the Most Rev. Dr. D.S. Lourduswamy, Secretary of the Sacred Congregation for the Evangelisation of the people, came from Rome, blessed and opened the new Infant Jesus Church in the presence of a very large gathering of faithful from different faiths. Thursday, June 22nd 1989, Infant Jesus Shrine, adjacent to the church, was blessed by His Grace, the Most Rev. Dr. Alphonsus Mathias, Archbishop of Bangalore and opened to the faithful to honour and glorify the divine Infant Jesus of Prague. 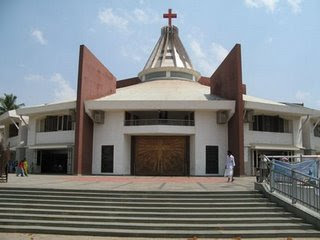 Thursday, ﻿June 9th, 2005, the new church was inaugurated by Most Rev. Dr. Bernard Moras, Archbishop of Bangalore, Dedicated by His Excellency, Most Rev. Dr. Pedro Lopez Quintana, Apostolic Nuncio in India; Blessing of the Tabernacle, by Most Rev. Dr. Ignatius Pinto, Archbishop Emeritus, Archdiocese of Bangalore. Please see the miraculous prayer used at Bangalore Infant Jesus church click here.